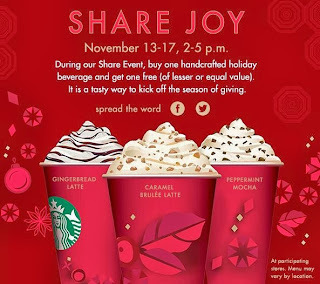 Share the joy this week and make someone's day by bringing them a holiday drink from Starbucks! Simply buy one handcrafted Starbucks holiday beverage and get the second on absolutely free! The BOGO Holiday Drink offer is only valid November 13th - 17th, 2 - 5 pm!